A new version of Picterizer has been uploaded. If you haven’t checked it out, this web application generates a picture of pictures (from flickr). Basically you upload your photo from your hard drive. The program uses Flickr to compile the picture. The new version now includes a “variance” factor as well as a new dimension choice (1728×1728) which will fit a 24×24 inch poster. The new variance (built in) will not ALWAYS select the closest average color picture match of the sliced region. This way the picture won’t have so many repeated pictures on solid color sections. The variance is 1% multiplied by the number of pictures in the pool. This means that if you select 500 Flickr results that means the program determines the 5 closest pictures to a color slice and chooses a random one. It’s hard to explain, but basically it means that more pictures from the pool of pictures found will be used (at the expense though of possibly losing recognition of the original picture). 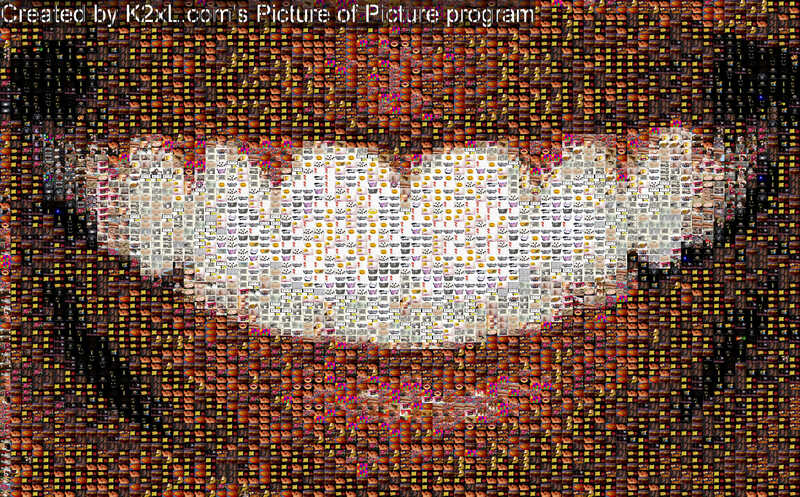 Here is a smiley face built with the result for the search “smiley” on Flickr. Even though the middle is solid white, it selects a random choice from the closest 5 white pictures (instead of the whitemost picture) in order to add some variance. You can also see I added a watermark (as I thought it’d be a good idea to get people spreading the application). Click here to Picterize your own photo. Remember, you can click “Save” on the bottom right to save it to your hard drive. Pass it around and send me the photos you guys make with it! And let me know if you find any bugs (I’m sure it isn’t bug free) or have any suggestions.